The BlackBerry Press looks like it’ll be launching at CES 2017, coming with a fan-favorite keyboard but also some ‘glimpses of the future’. Hot on the heels of the BlackBerry DTEK60, a new phone has been leaked by Steve Cistulli the North American president of TCT, the brand now behind BlackBerry phones. 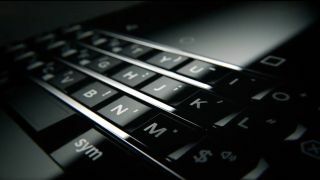 "We'll unveil more news at CES around our plans, showcasing the legacy of the BlackBerry smartphone brand,” he told the Press Association recently. “[We’ll] also be giving a glimpse into what new BlackBerry smartphones will offer as part of our bold new brand portfolio within TCT. “These are just the building blocks of our new growth strategy, with additional announcements to come in 2017." The new BlackBerry Press will still be running on Android, as the icons in the video give away, but will retain the same clickable keyboard that BlackBerry fans adore, with the raised plastic keys for speedy typing. We’ve seen this rumored already under the codename of the BlackBerry Mercury, a phone that will offer a 4.5-inch display (with an unusual 3:2 ratio rectangular screen), a 2.0GHz Qualcomm CPU, 3GB of RAM and 32GB of storage. The phone is also said to have an 18MP rear camera and an 8MP snapper at the front. Quite what the phone will reveal in terms of a ‘glimpse into what new BlackBerry smartphones will offer’ is up for debate, as the Mercury looked a lot like a fancier version of the unimpressive DTEK50 and DTEK60. The likelihood is that security will once again be the ‘future’ of these phones - but we’ll have to wait a few days to find out. Are BlackBerry and Samsung phones really that secure?